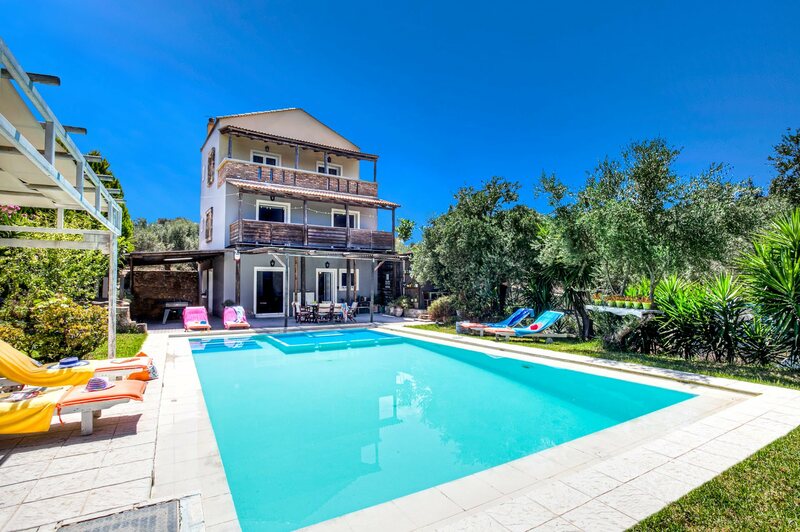 You get the best of both worlds at Villa Liostasi - a peaceful countryside setting, yet just 1 mile from the lively resort of Aghia Marina! You have a beautiful, golden sandy beach as well as several shops, bars and restaurants, just a 10 minute drive away. The villa itself has a spacious lawn and an inviting private pool. Inside, the house is full of charm, with traditional Cretan touches throughout. Pool heating, WiFi and air conditioning/heating in all bedrooms and lounge are included. Not only are you in an idyllic setting, the vibrant and lively resort of Aghia Marina is just a mile away! The private pool - with paddling area at one end - takes pride of place in the garden and is bordered by Mediterranean plants along with olive trees. There's 2 pergolas outside - one to the side of the pool for seeking respite from the sun, and the other at the side of the house, where the games tables are located. There's also a covered terrace with a table and chairs, as well as pleasant poolside BBQ area - great for sampling the local delights and dining alfresco. The driveway is lined with olive trees and there's adequate space for your hire cars. The front door is by the covered terrace and leading into the open plan living area. The open plan living area is light and spacious, with direct access to the covered terrace and pool area. There's a large corner sofa and flat screen TV, along with an additional seating area that surrounds the feature fireplace. On the other side of the room is a dining table and chairs, along with the well-equipped kitchen, creating a sociable space. The bright and comfortable bedrooms are spread over 2 floors. On the first floor are 2 twin bedrooms, each with an en suite bathroom. Both bedrooms also have access to a shared balcony. On the second floor the double bedroom has an en suite bathroom, as well as patio doors leading out to a balcony with views of the treetops and distant sea. There's a WC on the ground floor. This villa is registered and licenced by EOT Greek licensing association. This number is: 1042K10002984401. If you're a beach lover, Villa Liostasi is a great choice, located just 1 mile from Aghia Marina, which is said to have one of the best beaches on the island! There's a wide choice of places to eat, drink and shop both on the seafront and the nearby old village of Pano Aghia Marina. Whether you choose to dine in a waterfront restaurant, or opt for an authentic family-run taverna in the village square, you'll be spoilt for choice ! The charming resort of Chania has a good mix of shops, bars and restaurants in both the old town and harbour, which is 20 minutes' drive from the villa. In Aghia Marina there's is a mini market and supermarket for those daily essentials, as well as several shops to choose from, which are ¾ mile from the villa. Every Saturday in the resort of Chania is a market where you can pick up fresh fruit and vegetables, as well as the local cheese. The old town has a mix of shops ranging from a boot maker to boutique clothing. You'll be spoilt for choice on where to eat in Aghia Marina. There are several tavernas that sell the local food such as Beef Stifado and Lamb Kleftiko. If you prefer fish, there are some waterfront tavernas that overlook the sea. Or why not put on your dancing shoes and head to one of the many nightclubs or cocktail and music bars? The closest beach to Villa Liostasi is Aghia Marina. This Blue Flag Beach has crystal clear sea, golden sands and a selection of beach bars and tavernas, all just a mile away. For a day at the beach, Elafonissi is ideal! There's white sand and pink hues and turquoise-white lagoon waters that ripple in the breeze . It's an hour and a half drive away but is well worth it when you get there! For some fun in the sun, Limnoupolis Waterpark is a 30 minute drive from the villa. It's full of adventure, with its waterslides for the energetic and the lazy river for the more laid back members of the group. From Kastelli, to the west of Chania, you can catch a ferry to the terrific Balos Beach, where the clear blue waters and golden sand make a great day out. The resort of Chania is not to be missed! The Venetian Harbour is fringed with tavernas, cafes and bars. This is a great place to rest after a day exploring the maze of alleys in the old town of Chania and along the harbour. If you head east of Aghia Marina, you'll find the British cemetery of Souda Bay, which is the resting place for soldiers who fought in the war. Or , the Samaria Gorge is worth a visit. This is Europe's longest gorge that's 11 miles long - be prepared to be wowed! Villa Liostasi is not available to book for season as it is sold out. Take a look here at the Crete villas that are currently on sale. These mini train type vehicles run between resorts all over the island taking visitors for a ride at a leisurely pace for a couple of hours at a reasonable cost. Several play parks are dotted around the resorts for young members of the family to let off some steam whilst mum and dad keep watch from the comfort of a chair. Bouncy castles, ball pits, padded adventure playgrounds etc. Nearly all resorts with organised beaches offer water sports of some description depending on the local conditions. They may vary from paragliding, waterskiing, kyaking, banana boats and jet skiing. Our second Villa Plus holiday and yet again the service/process and villa surpassed our expectations. The booking team were extremely helpful and accommodating. The paperwork was accurate and issued with efficiency. The villa was exceptional and well presented and maintained by a very welcoming and helpful owner Nikkos and cleaner Sofia. The attention to detail was faultless even down to the very detailed directions to the villa. Thankyou to all those involved in helping to make our family holiday a wonderful experience. Hotel holidays are history!! Very enjoyable week - secluded but not in the middle of nowhere. Views were superb and all facilities exactly as hoped. Nikos (the owner) is a great guy too. Thank you! Villa was just lovely! As was the owner and the Villa Plus rep. Villa was very well looked after and in a secluded area. We had an amazing time and the weather was fantastic! Would love to return to Crete again and wouldn't hesitate to chose Villa Liostasi again.